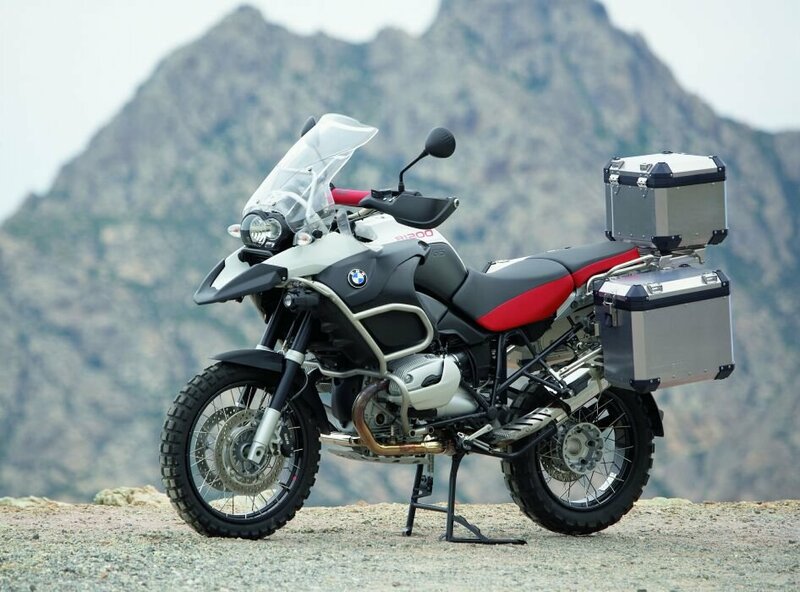 There’s a new ‘techspec’ that was been launched on the market with the introduction of the BMW 1200 GS Adventure that no one has picked up on yet, you no longer need to think in MPG (Miles to the Gallon) more DPT or ‘Days to the Tank’. 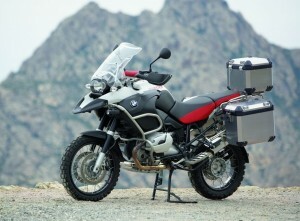 The GS range of bikes have always been classed as long distance road bikes with a limited amount of off road being available should you need it, that changed with the introduction of the ‘Adventure’. A bike that is more than capable off road than any other road bike before it, but we are not talking about the odd dirt track, this bike can do more than you think. So what’s it like to ride? It’s full of surprises. The first think you notice is the size, this thing is enormous. The handlebars( inc mirrors) measure 955mm wide, or in English just under 3 ft 2 inches, the seat height can be adjusted between 890-910mm, or 3ft so the vertically challenged need not apply. It is 2250mm long-just under 6ft 9 inches, 1470mm high-4ft 10in, the screen takes it up to around 5ft 4in and it weighs 256kg-564lbs fuelled. The fuel tank holds 33 litres of your finest 95 octane unleaded with the last 4 being the reserve, so as you can imagine it’s quite big, especially round the waste. Looking at it from the front it measures just over 2ft, plus around 6in each side for the leg guards, and with the opposing cylinders (or sticky out bits as the wife calls them) this bike gives a big frontal mass that surely no car driver could miss? So job one is getting on it, at 6ft 1 I couldn’t throw my leg over so had to do the off road mount which entails having it on the side stand, front brake on, stand on the left peg and throw your leg over…easy. Once you’re on you can lift it up straight and put your feet down, though I was on tip toe when on my own. Press the start button and the bike rocks slightly once to the left then the right and settles, at first it has a bit of a rattle but once it warms up this disappears. The usual BMW indicator switches abound with pressing both together starting your hazard lights, indicator cancel switch and heated grips switch (extra) finish the right hand side with the ABS and HI/Lo/flash switches on the right. Between the handlebars mounted on the ignition housing is the Fog Light switch (extra). The dash gives plenty of info with 3 trips, gear indicator, ambient temperature, average mph, average mpg, fuel/temp gauges and more. The Speedo and rev counters are both dials and clear to see. Riding home gave me the time to get used to the handling, brakes, steering and weight ready for the off on the Monday morning, but where should we go? It’s designed and marketed as a long distance bike so we (me and she who must be obeyed) decided onWales, the North of, it is somewhere we have always said we wanted to go to and although 3 days wasn’t that long we went for it. We left Sheerness and headed, via the M20 to the M25, from there we hopped onto the M3 as far as Jct 3 then cut up throughBracknellto the M4 and pulled into Reading services 116 miles later. There was one area I had to be extra vigilant about and that was filtering, as well as the bike being wide at the front I had the BMW alloy boxes (extra) on the back with our clothes in which could make a bit of a ding if I got it wrong. Other than a couple of plonks the majority of people saw me coming from miles back, a bit more with the fog lights on (extra). So far the wife was well impressed with the pillion comfort, the seat for both rider and pillion is extremely comfy and with the foot pegs being that much lower it was like an armchair without the back. We had finished our coffee and were walking to the exit when the first lot of rain hit us, with the waterproofs on (which wouldn’t be the last time) we were off again heading west forSwindon. The ride to Jct 15 was a damp one, or would have been had the screen not worked so well, I had adjusted it up a couple of clicks from standard and it did the job. The leg guards kept the majority of the rain off my legs and the cylinder heads did the same for my feet, on the back the water seemed to be spraying up the back of the wife’s waterproofs so that would need looking into if you own one. We jumped on the A419 that runs/meets the A417 going to Gloucester. Three miles South of Cirencester is my old Army base where the wife and I met, we couldn’t stop because of the security state being high so we pressed on to Hereford where the wife worked in the NAAFI on the RAF base there. That was 19 years ago and both bases had changed but not as much as us, and with our 18th anniversary in June gone it was a bit of nostalgia. Again we had to keep moving so we hit the back roads but where were we going to kip that night? A quick call to an Army mate and the deal was done; we were staying with him inNewtownfor the night and for free! He told us to use the A483 from Crossgates to him which is a nice bike road in the right weather he said! It was lashing down and I hadn’t ridden the bike on wet A/B roads so this would be different. I need to say this now so everyone knows why I don’t keep mentioning it throughout this, ‘THIS BIKE HAS NO RIGHT TO HANDLE AS WELL AS IT DOES’. The road got twistier the further North we got and even 2 up I could keep up a decent pace, faster than most cars and was really enjoying it, but what Taff-(what other name would he have?) forgot to mention was how tight they got as we descended a mountain into the town. Despite having to brake hard on a couple of occasions the bike ran true and cornered with no problem. Note: As yet I haven’t put any petrol in on route and the route I took was 262 miles. After an entertaining night of food and beer we were heading north again, but where too it’s a big place. Looking at the ‘Best Rides Motorcycle Atlas’ that you can buy through the Bmf website I noticed a name that was familiar, “I am a person not a number” should bring back memories for those of you over a certain age. The programme was Prisoner in the seventies and the place was Port Meirian. Still in the rain I was feeling very comfortable with the cornering abilities of the GS, it has 6 gears but off of dual carriageways/motorways you don’t need 6th. Dropping into some of the lower sections of the road you just twisted the grip a bit further and the bike would take off, I nearly lost the wife a couple of times and was ready to get the t-shirt but she hung on. We were 4 miles from Portmahog and the fuel light came on, we had done 324 miles on one tank (opening paragraph), checking the dash the bike had averaged 50.7 mpg-what can you say? We had done a fair bit of motorway and A roads; I didn’t sit at 56mph to get the best figure I rode how I normally do and was stunned but the return. Coming over the higher peaks you’re in a low gear pushing high revs but it doesn’t seem to have made a difference. With a fresh 33 litres in the tank I was ready for the change to the handling, braking etc but there was none of it, this bike should be as much use in corners at this weight as a chocolate fireguard but handles the same as having ¼ tank, and to engineer that into a bike is an extremely clever thing to do. I know we’re not looking at conventional suspension up front but even so, you would imagine there would be some kind of noticeable difference but there isn’t one that I could find. After an hour looking around we mounted up and headed forMountSnowdonon the A489, a very narrow road for the first 10 miles or so then as you beginning to climb it widens up but there are cars in the way…only one thing to do! It wasn’t long before we were on our way and on our own. Sleeping place needed, on our way home I had decided to do the Cat and Fiddle, a bike route that you read about but never think you’ll get to ride so we need somewhere local, got it, my sons inManchester. Another night of fun and talking over we were heading home but not until the C&T had been done. Heading to Macclesfield in the rush hour the width of the bike began to show, filtering in an urban area with what seems to be half the country is not an easy task. I consciously know the boxes are on there but not being quite as wide as the handle bars it’s easy to watch, however, when you pass a car and pull in it would be easy to forget and clop a car with one, not too clever. The Cat & Fiddle is a brilliant riders road, I have done a few of the so called best roads to ride but I think this is the best so far. Again there were a few cars but once we had passed them it was open road, with the tight corners, long drops and sheep, you would be mad to ride it like a lunatic, but 50ish is a nice speed. Again pushing the bike and increasing the lean angles while we had dry roads was good fun, touching a boot down on one of the sharper corners shows just how well this bike handles. With that road done it was home via Vines BMW in Guildford who loaned me the bike, I had to put £5 of juice in at Warwick services when we had a bum/coffee stop to make sure we got there, and we did it with plenty left. So what do I think of the bike? The ride is comfy, handling is excellent for a bike of this size/weight, the engine pushes out 100bhp @ 7000rpm with 115nm of torque all pushed through the shaft drive giving the rider instant power when he/she needs it. The hand guards do a good job of keeping the wind off but these again are extra’s, personally I think on a bike of this style heated grips and the guards should be a standard fitting. Would I buy one? probably not and not because the bike is in anyway bad, it’s excellent, I just feel it is a bit too big for the riding I do and with a base price of nearly £10,000 it is a very expensive machine. The extras on the bike I had total around £3000 so as you can see it soon tots up.